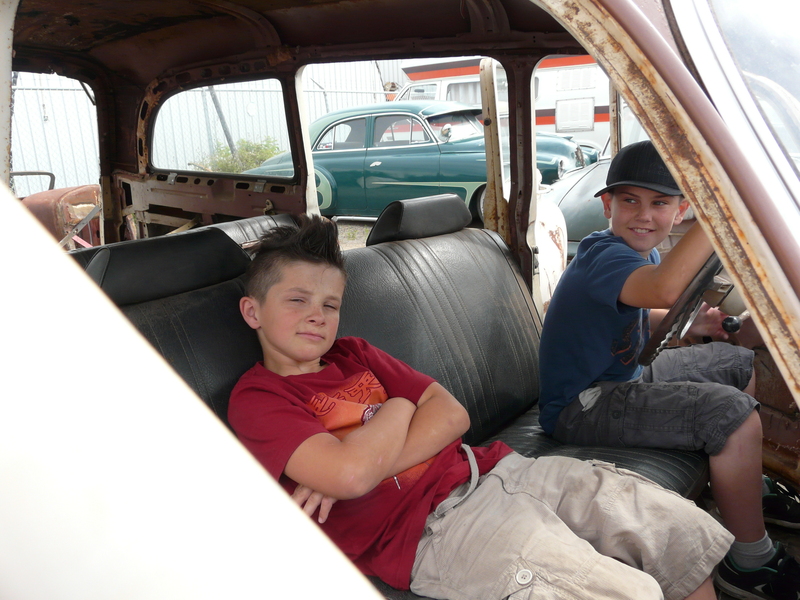 One of the reasons we wanted to find an older ride was so the kids would be able to experience the nostalgia and the fun that comes with having a vintage car. Betsy my 1954 wagon will soon be our daily driver in the no snow months and I am really excited to cruise to town to do my errands and have the kids bouncing around in the back seat. With the up coming Pageant in Edmonton being a big event we made plans for the kids to travel south with us. It would be the first time seeing Betsy and I was getting super excited for their introduction. I was not really sure what was going to happen in the moment, if the boys were going to question her state of being, kick a tire and claim they were tire and when were they leaving yet to my surprise none of that happened. Instead as I came through the shop to the back I saw that the guys had rolled her out of her spot, all four doors open I can see two figures in the front seat. There were my boys, pretending to drive and quite content with in the envelope of Betsy’s interior, bouncing as if they were rolling down the streets and their faces a glow with the great fun the two were having. This was more than I could have hoped for and I can say Betsy is officially part of the family.